President Trump, congressional Republicans and most American farmers share common positions on climate change: They question the science showing human activity is altering the global climate and are skeptical of using public policy to reduce greenhouse gas pollution. But farmers are in a unique position to tackle climate change. We have the political power, economic incentive and policy tools to do so. What we don’t yet have is the political will. As a fifth-generation Iowa farmer and the resilient agriculture coordinator at the Drake University Agricultural Law Center, I deal with both the challenges and opportunities of climate change. I also see a need for the agriculture community to make tough choices about its policy priorities in the face of dramatic political shifts in Washington. Pundits, agriculture groups and President Trump have identified farmers as a key demographic in the Republican victory. How we leverage this influence remains to be seen. Trade and immigration policy and the president’s fiscal 2018 budget proposal are already creating disagreements between farmers and the Trump administration. We will need to be strategic in using our political power to shape agriculture policy. My research and farming experience convince me that even in today’s unpromising political conditions, agriculture can play an important role in addressing climate change. American farmers can become global leaders in producing what the world needs as much as abundant food: a stable climate. Prior to 2009, thousands of farmers across the United States participated in two large-scale projects designed to maintain or increase carbon storage on farmlands: the National Farmers Union Carbon Credit Program and the Iowa Farm Bureau AgraGate program. These programs paid farmers for limiting the number of acres they tilled and for maintaining or establishing grasslands. Payments came through the Chicago Climate Exchange (CCX), a voluntary market in which businesses could buy and sell carbon credits. But after Barack Obama became president in 2009, farmers overwhelmingly joined the opposition to climate change action. As agriculture journalist Chris Clayton documents in his 2015 book “The Elephant in the Cornfield,” farmers viewed Obama’s climate strategy – especially the push for cap-and-trade legislation in 2009-2010 – as regulatory overreach by a Democratic Congress and president. For example, after the Environmental Protection Agency briefly mentioned livestock in a 2008 report on regulating greenhouse gases under the Clean Air Act, farmers and agriculture trade groups erupted in outrage at the prospect of a “cow tax” on methane releases from both ends of the animal. When Congress failed to enact the cap-and-trade bill in 2010, the CCX went out of business. The election of President Trump and Republican majorities in both houses of Congress eliminates the regulatory “bogeyman” that many farmers organized to reject in 2009. In our opposition, farmers rejected an opportunity to be paid for providing environmental services. Forgoing new sources of income might have made economic sense during the historic commodity boom between 2009 and 2013, but it no longer does. 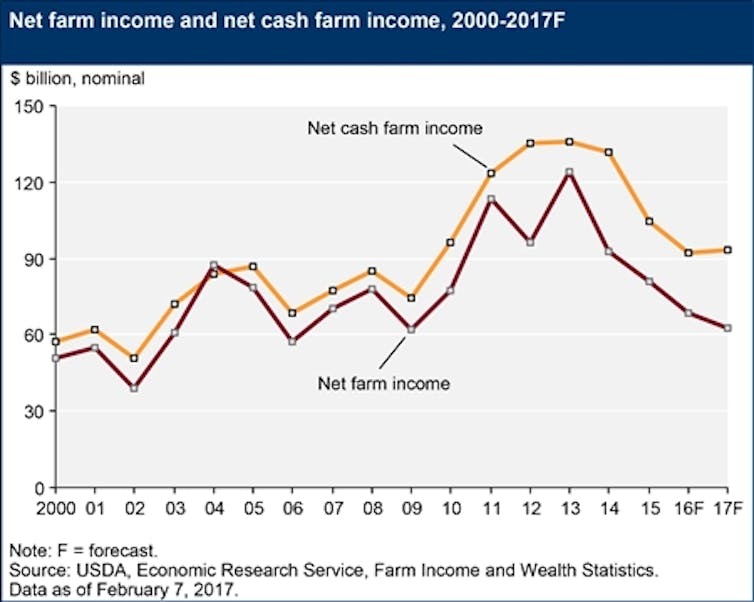 Recently the farm economy has soured. After several years of historic profitability, 2017 looks to be the fourth straight year of declining income. American farmers face forecasts of stagnant to declining revenues. Farmers may now be willing to consider new ways of generating income by adopting environmentally friendly practices, such as planting cover crops, extending crop rotations or eliminating tillage. Many farmers are already using these practices on a small scale. To combat climate change, we need to apply them on nearly all of our acres. And we need to develop new environmentally friendly practices. Farmers are motivated by economic incentives to implement environmental practices. 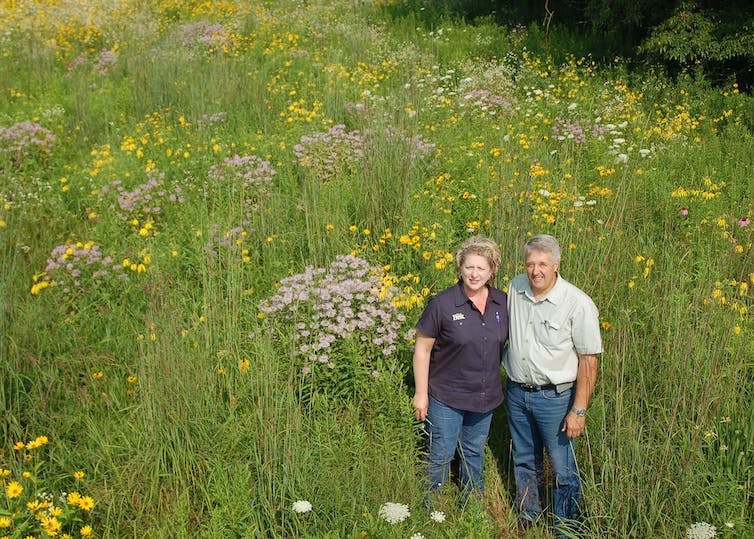 As an example, they recently enrolled nearly 400,000 acres in the USDA Conservation Reserve Program CP-42 which pays farmers to take land out of production and establish habitat for pollinators. Ironically, today we may need to embrace a source of revenue that just eight years ago seemed to many like regulatory overreach. The world came together in December 2015 to complete the Paris Agreement, which signals a major advance in global commitments to address climate change. All participating countries commit to lowering their greenhouse gas emissions. A number of American businesses have started to support putting a price on carbon. Agriculture was noticeably absent from global climate discussions, but farmers could profit from policies that monetize carbon and create new markets for carbon emission allowances. At the Paris conference, the French government introduced the 4 per 1000 Initiative, which challenges farmers to increase the carbon in their soils. Other national governments, universities and agricultural organizations have joined this effort to advance agriculture that captures and stores carbon. Now American farmers face a choice. Do we want to explore ways of providing environmental services to fight climate change? Or will we sit back and allow farmers in other parts of the world to develop these agricultural solutions? California is already showing the way by inviting farmers to participate in public-private efforts to address climate change. The Trump administration rejects policy efforts to protect the climate and indicates the United States may pull out of the Paris Agreement. Therefore, farmers will need to flex our political muscle to support climate solutions. Fortunately, we have powerful policy tools at our disposal. Agriculture organizations and lawmakers are developing the 2018 farm bill, which will guide U.S. agriculture policy for several years, likely through 2022. Forward-thinking farmers can use this legislation to develop programs to pay for climate-friendly environmental services without radically changing the way we farm. Relatively small innovations can deliver payments for environmental services, which initially would be supported by American taxpayers but later could be funded by carbon markets. For example, conservation programs currently target soil erosion. Policymakers would need to add rewards for reducing emissions and sequestering carbon. As a starting point, the next farm bill can identify practices that produce these outcomes and incorporate them into existing programs. The bill could also develop new programs to accelerate farmer innovation. Farmers have a history of working together. Federal programs supporting ethanol and biodiesel production and wind turbines on farmlands all came about because farmers advanced public policies to support these products before clear market demand existed. In the same way, we can use the farm bill to increase farm income by monetizing the public benefits of climate services. When the CCX collapsed in 2010, farm groups had already lost money trying to develop a program before there was enough public support to sustain it. We learned that it requires both government action and business leadership to successfully reward farmers for environmental services. By advancing payments for climate services in the next farm bill, we can make our farms more resilient and align American agriculture with global business interests. If history is a good predictor of our future, no one is going to do this for farmers. We will have to do it for ourselves. 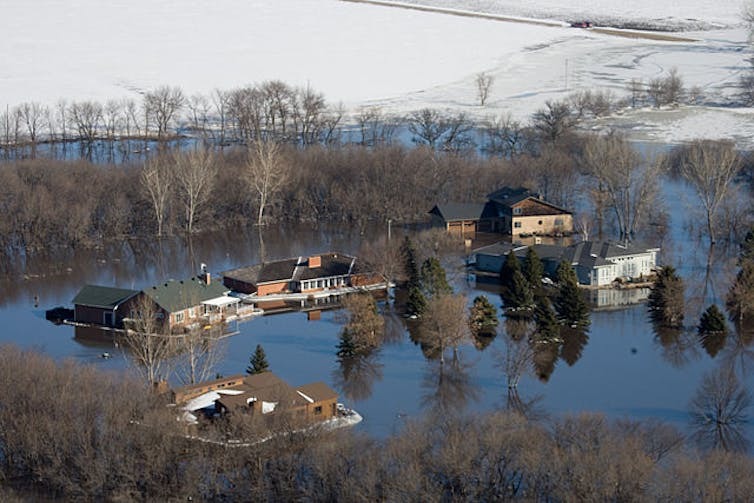 The author of this article Matthew Russell, Resilient Agriculture Coordinator, Drake University. This article was originally published in The Conversation under a Creative Commons Attribution No Derivatives license. Read the original article here. How does one make personal decisions about climate change issues? A new book coming out the summer, The Behavioral Economics of Climate Change: Adaptation, Global Public Goods, Breakthrough Technologies, and Policy-Making, shows readers how to understand mitigation strategies emerging from global warming policy discussions and the ways that changing climate conditions can alter these strategies. Through quantitative analyses, case studies, and policy examples, this bottom-up approach to climate change economics gives readers the tools to create effective responses to global warming. Self-contained and well-structured, The Behavioral Economics of Climate Change covers key scientific and economic subjects in an applied, innovative, and immediately relevant fashion. To pre-order a print or e-copy of this book, visit the Elsevier website here. Apply discount code STC317 to save up to 30% off the list price and free global shipping.